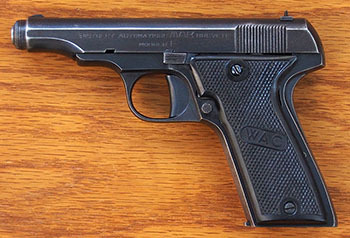 The raison d’être for the MAB Model E pistol escapes me. It was first manufactured in 1949, the same year that manufacturing of the Model B ended. 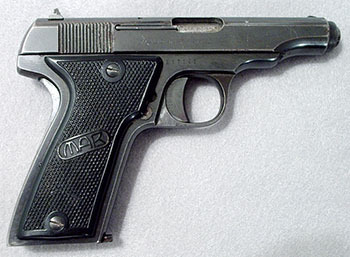 According to Bastié and Casanova, Model B production was phased out because there was little market in France for a tiny, concealable 6.35mm vest-pocket pistol after the gun law of 1937 prohibited the average Frenchman from carrying a weapon, but they give no explanation as to why a larger 6.35mm pistol should have gone into production at that time. 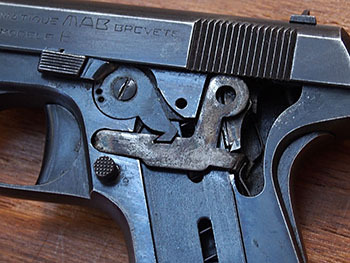 There was a resurgence of interest in target shooting in France in the late 1940’s, but beyond that I can think of no special market for a relatively large 6.35mm pistol, and the Model E does not have target sights. 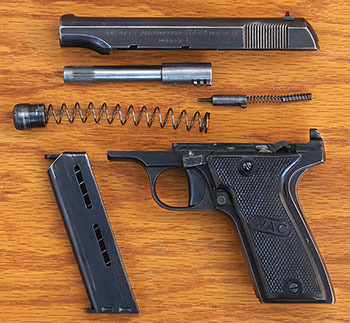 The 6.35mm Browning cartridge (also known as the .25 ACP) was designed for small, concealable pistols, and very few pistols larger than vest-pocket size have ever been chambered for it. The largest I can think of off hand are the 1910 Mauser and the Walther Model 8, both of which are smaller than the MAB Model E.
Bastié and Casanova describe the Model E as a down-sized Model D. It has been pointed out to me that the Model E is nearly identical in size to the Model C, and has the same grip angle. The Model E is an unlocked-breech semi-automatic pistol, based on the 1910 Browning design, chambered for the 6.35mm Browning cartridge. The recoil spring surrounds the barrel and is held in place by a bayonette-type bushing at the front. The magazine release is behind the trigger where it can be easily accessed by the thumb, and the manual safety lever is just above the trigger, also readily accessible by the thumb of the right-handed shooter. The connector and disconnector are on the left side of the gun, covered by the left grip plate. The manual safety locks the connector and the slide. 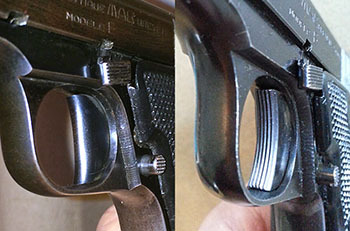 There is a grip safety on the back of the grip, and an internal magazine safety prevents the gun from being fired when the magazine is not inserted. The grip angle is a bit more acute than that of the Model D. There are sixteen vertical triangular-cut slide serrations at the rear of the slide. The front sight is fixed; the rear sight is dovetailed into the slide and is drift-adjustable for windage. The right side of the slide is marked MADE IN FRANCE. In the early 1950’s these guns were imported into the United States by the Western Arms Corporation. Imported guns were marked MADE IN FRANCE FOR W.A.C. and may also have grip plates marked WAC instead of MAB. The grip plates are of checkered plastic with the MAB monogram in an oval cartouche. Visible in the ejection port, the barrel is marked CAL, 6’35 M/M. The unmarked magazine holds nine rounds and has two oval vertical cuts on the left side to allow cartridges to be viewed. According to Bastié and Casanova, production began with serial number 1 on 25 March 1949. On 22 March 1954 a new machine for rifling barrels came into use, and the first Model E barrel to be rifled with the new machine was serial number 9521. So approximately 10,000 were made in the first five years of production. In 1956 a new series of numbers was begun at 214001. The highest serial number I have recorded thus far is 217193, so we know that at least another 3192 were made, and probably more. 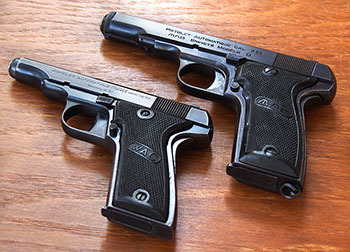 I would ask collectors to please send me their serial numbers so I can obtain a more accurate estimate of how many Model E pistols were made. * Production ended in 1964. The only variant I have observed is that the front of the trigger on later production pistols was flattened and grooved. Press in and turn the barrel bushing 1/4 turn and ease the bushing forward (be careful, as it is spring loaded). Remove the bushing and recoil spring. Draw the slide back and lock it open using the manual safety in the second detente on the left side of the slide. Turn the barrel counterclockwise, rotating the barrel lugs up into the slots cut in the interior of the slide.